Ankle braces come in all kinds of shapes and sizes. They can be purchased from sporting goods stores, from your doctor, even the pharmacy. Not all braces are created equal, and choosing the right one can sometimes be tricky if you don't know what to look for. Well, it braces your ankle. Seriously though...a brace can provide additional support to the ankle ligaments and muscles, contributing to improved stability and ankle control. How exactly does it do this? Ankle braces provide compression around the ankle. This helps to increase the proprioception within the ankle joint, allowing the muscles to function more effeciently. That is the primary benefit of an ankle brace. Many ankle braces are nothing more than just an elastic material shaped to fit around the ankle. I refer to these as ankle sleeves. They may help to make the ankle feel better, but they do not provide any real support. For very minor ankle sprains, they may be effective. 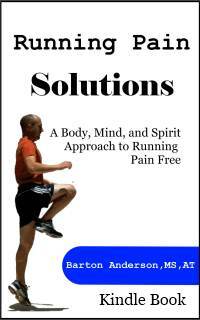 They work through compression and increased proprioception, not through actual structural support. No matter what type of ankle injury you have, if you are purchasing a brace, you should find one that completely surrounds the ankle. This will ensure good compression, and you will get the most out of the brace through improved proprioception. I usually do not recommend wearing a brace to my patients unless they have had a recent ankle sprain. Some people will tell you to wear a brace to help prevent injury. I wish that there was a brace out there that could prevent ankle sprains, but there isn't. The amount of force that can occur at the ankle when you land on it wrong is very strong, and most braces will not prevent a sprain. A good ankle rehab program is much better for preventing ankle sprains than a brace is. If you have had a recent ankle sprain, a brace is a good idea, especially the first few weeks after you return to your sport. It will help provide compression and support to the ankle, and will help the muscles work more effeciently. It is not a cure all, and should not take the place of a good rehab program after your ankle sprain. I also recommend to my patients that they try to work out of the brace after a few weeks. A good brace will completely surround the ankle, it will have some way to adjust tightness, such as laces or velcro, and it will have supporting straps that wrap around the heel. My favorite, and the one that I recommend to all of my patients comes with two different straps that wrap around the heel from both sides. I believe that this style of brace offers the most structural support, as well as the best compression to improve proprioception. Not all braces come with straps, but if you have the choice, I highly recommend one that does. Sturdy straps with velcro attachments will help to keep your ankle stable during sports. Some braces do not completely surround the ankle. They may be stirrup type braces that only cover the outside parts of the ankle. While they may provide some support, they do not provide as much compression, and so the proprioception function of the brace is limited. Braces that do not have laces or some way to adjust the tightness can be less effective because you can't keep them tight throughout your game or practice. Even braces that can be laced up and that have straps will need to be adjusted once you have started playing. 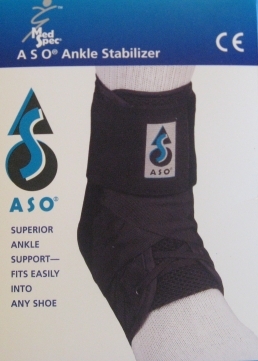 I highly recommend the Ankle Stabilizing Orthosis, or ASO™ ankle brace. It is the one that I put all of my patients in. Compared to other braces, it provides superior support because of the two heel straps. It also completely surrounds the ankle, providing good compression for increased proprioception. It is very well made, and will stand up to the wear and tear of a full season of sports. You can find the ASO at many sporting goods stores, and even on ebay for a reasonable price, usually around $20-30. Choosing an ankle brace can be tricky, but if you follow these guidelines you should come home with a good and effective ankle brace. Make sure that you choose a size that fits well, and follow the instructions for proper application. Remember that an ankle brace should not be used in place of a good ankle rehab program.